can explain them without having to refer to the text. I.B.1. 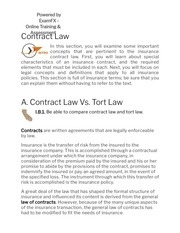 Be able to compare contract law and tort law. risk is accomplished is the insurance policy. had to be modiﬁed to ﬁt the needs of insurance. © 2017 ExamFx All rights reserved. An unintentional tort is the result of acting without proper care. This is generally referred to as negligence. underwriter approves the application and issues a policy. The binding force in any contract is the consideration. promise to pay in the event of loss. contract, and not under the inﬂuence of drugs or alcohol. for example, it must have both: insurable interest and consent. cannot be enforced by any party. (insurer) and accepted or rejected by the other party (insured). the insurer in the event of loss. John purchases a homeowners insurance policy for $100,000. losses covered by a policy in force. person. However, the insurer must still be notiﬁed in writing. contract of insurance is set forth. insured gives to the questions on the insurance application. the underwriting decision of the insurance company. to the effectuation of the policy, but not after. decision to enter the contractual terms. execution of the policy and will be contained in the policy itself. entitles the other to rescind the policy. an informed decision about the quality or nature of the contract. may entitle the “injured” party to rescind the contract. either party. Disadvantages are always material information. diagnosed or treated for cancer, heart disease, or diabetes? they ever been convicted of a felony? just the advantages of the contract. underwriting decision. Concealment may void a policy. faith without attempting to conceal or deceive the other. Information based on personal judgment. entitles an injured party to rescission of a contract (CIC 331). Rescission is the revocation of a contract. all insurance policies (CIC 381). the termination or expiration of the contract. speciﬁed in an insurance policy - CA Educational Objective. c. Rate/premium, earned and unearned premium. This file has been shared by a user of PDF Archive. Document ID: 00622318.